A year before this picture was taken, walking on this street was a fantasy walk that I would never have dared to take. It’s one of the hardest hit, most volatile streets in Skid Row…..full of life, and sounds, smells and sights hard to take in all at once. My wish was to be able to walk alone with my camera and take honest street photos without causing offense to anyone or harm to myself. I can sometimes do that at this time, but must always ask, engage and be prepared to respond on the spot to questions that can become very intense very quickly, sometimes requiring me to prove that I’m not a police officer (I’ve been patted down and searched for listening devices ) or show extensive samples of my work, stored on my iPhone. It’s understood that it’s never acceptable to try and sneak a picture….never never never or the price paid will be a dear one. This image is of a Sunday afternoon prayer between three women. The woman in the middle, along with her companion seen in the background, occasionally walk the most dangerous streets alone, offering to pray with anyone who feels the need for some hands-on attention. That’s courageous, considering the circumstances. Religious pursuits are generally not cause for irrational outbursts from unstable residents of the street but the absolute chaos and unpredictability that occurs randomly throughout the day makes each and every foray a risk. These moments last for a minute or two, and then vanish…..swallowed up by the street and forgotten almost immediately. The two women on either side were moved to tears by the attention. 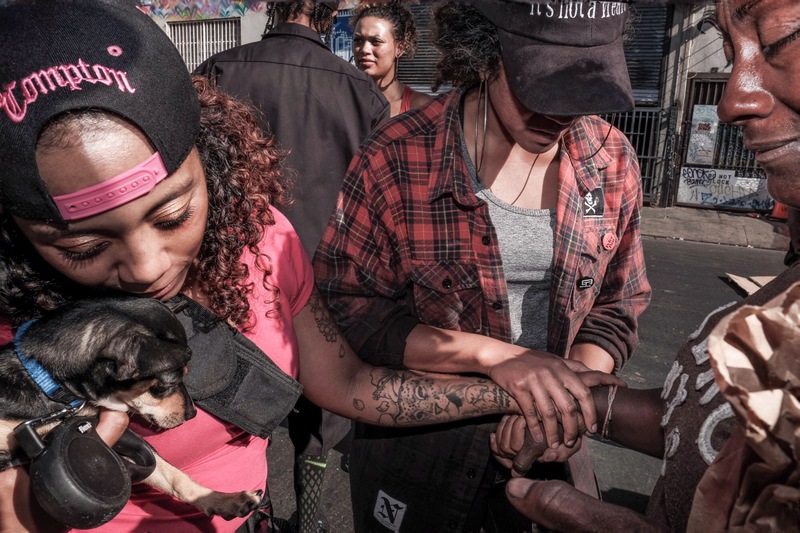 These interlocks mean something, if only for a brief period before people resume their daily lives, deeply enmeshed in the drug culture that is Skid Row generally and this street in particular. Thanks Nancy for reading and commenting….I think blessings are for all of us….and your heart is always pure, and in the right place….